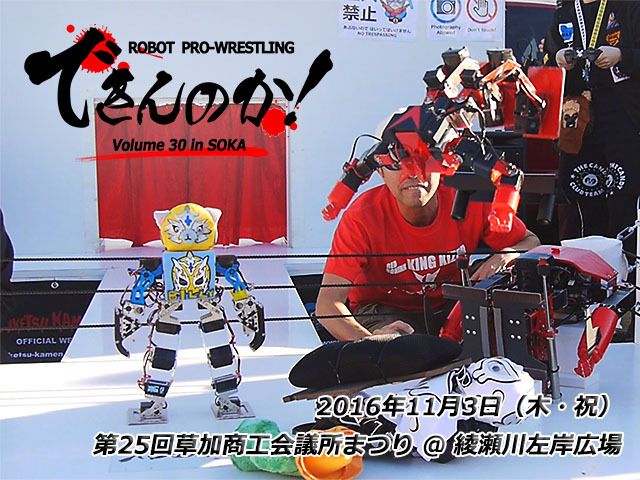 Robot Professional Wrestling Match, `Dekinnoka!30`, sponsored by Omata-san took place in Soka City on Nov 3, 2016 during the 25th Soka Chamber of Commerce and Industry Festival 2016. Dekinnoka!30 was the 10th Dekinnoka! in Soka Camber of Commerce and Industry Festival. The 1st Dekinnoka! took place on Nov. 3, 2008 in the Festival. Six matches started at 2:30 pm. One pre-match and 5 matches were carried out in the 30th. The openinng single match was Kagura vs Yukikaze, the 1st single match was Afro vs Tokotoko-maru, the 2nd match was Galapy vs Kumataro and the 3rd match was Kanto Regional Championship, challenger Metalic-fighter vs champion Newtrino. The 4th match was tag match, Birinyan-kid, Engel-Kizer and King-Kizer, these three robots joining Kansai Robo-wrestling TeamBambi vs Ryuketsu-kamen, Waroo and Akiba-Kizer. The main event was Kanto Robot Heavy Weight Championship, challenger Yogoroza vs champion Saaga. Results of all matches were reported here. NHK Capital Region News put the news of Robot Pro-Wrestling on the air. AbemaTV also put the news of on the air. Sanzai-san also reported the detail of mathes (in Japanese). The most interesting match was the 4th tag match. King Kizer had a trick in professional wrestling, called dropkick to Ryuketsu-kamen as the follow picture and in the following video at 8 minutes and 14 seconds. A new type Saaga attached wheels in the foot, kept the Kanto Heavy Weight Championship in 8 times as the table following the main event match video. `Dekinnoka!` in Japanese, means `Can you do it?`. 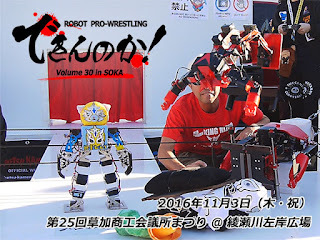 As Omata-san has been loving real professional wrestling, the 1st Robot Professional Wrestling in Soka on Nov. 3rd, 2008 was planned and held by him. He explained the 'Robot Professional Wrestling' was not 'Wrestling' but 'Fighting Arts'. The purpose of `Dekinnoka!` was not only robot fight but also to inform pleasure of robot. He planned not only wrestling match but also the back story of each wrestler character such as a real pro-wrestling match. 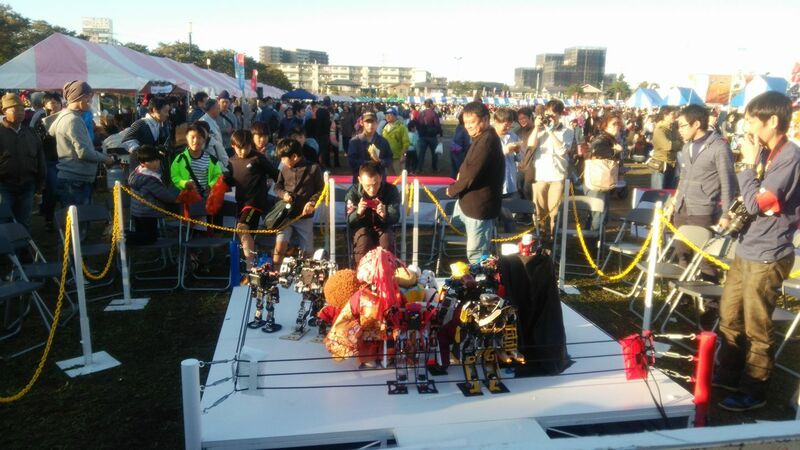 Robot Pro-Wrestling `Dekinnoka!` took place during 8 years. `Dekinnoka!` has been also supported by the members of Kanto-Robot-Training-Group. Reports of `Dekinnoka!`, `Dekinnoka!2`, `Dekinnoka!3`, `Dekinnoka!5`, 'Dekinnoka!6' , Dekinnoka!7' , `Dekinnoka!8` , `Dekinnoka!9` , `Dekinnoka!10`,`Dekinnoka!10.5, `Dekinnoka!11 , Dekinnoka!13, Dekinnoka!16 , Dekinnoka!18 and Dekinnoka!26 have been uploaded in this blog. Videos were also uploaded to the 'Dekinnoka Official Site` by Omata-san. 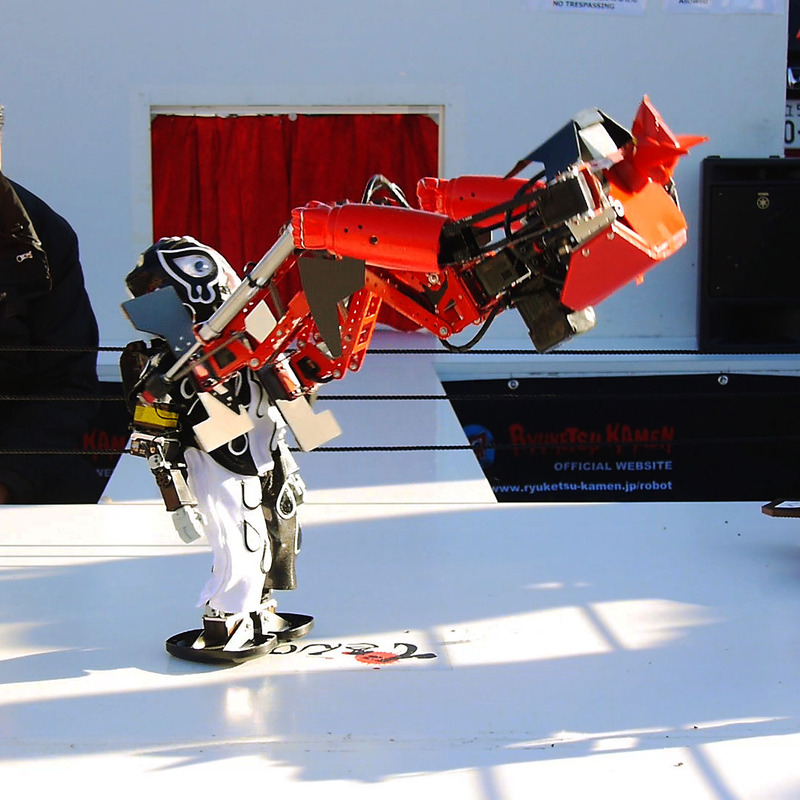 You can watch the details of the Robot Professional Wrestling results and videos by clicking each poster of Dekinnoka!